From North West Unison website: The staff will no longer be paid just the legal minimum wage but receive the NHS rate for the job. 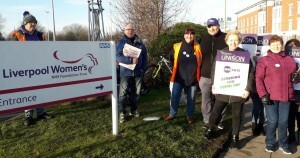 UNISON members who work as domestics, catering staff, porters and security staff at Liverpool Women’s Hospital have won their campaign to secure NHS rates of pay. The staff will no longer be paid just the legal minimum wage but receive the NHS rate for the job. This is worth more than £1 an hour, and over £2,000 a year for full-time staff. Staff will also as part of a 3 year deal get the same payments as their colleagues for working anti-social hours, overtime and weekends. The pay increase is to be jointly funded by the private contractor OCS and the Trust. Donate to the film: ‘Wapping – the workers’ story’ – During the 1986 battle between News International and the print trade unions, the strikers were sustained by the solidarity of thousands of workers in the UK and abroad. In this country, 50 Print Workers’ Support Groups were set up, some of them directly linked to local Trades Councils which played a key role, organising public meetings, raising money to sustain the strikers and picketing sites connected with News International. We are now appealing to Trades Councils and others for donations towards the completion of: ‘Wapping – the workers’ story’ a film about the momentous year-long industrial dispute which began when Rupert Murdoch plotted to move production of his papers overnight from central London’s Fleet Street to a secretly equipped and heavily guarded plant at Wapping, a docklands district in east London. 5,500 men and women lost their jobs and centuries of tradition in one of London’s last manufacturing industries came to an end. Military-style police tactics, the use of new laws which shackled the unions’ hard won freedoms and strike-breaking organised by the electricians union led to a Murdoch victory. The dispute had international ramifications for Murdoch’s expanding press and broadcasting empire in the United States and around the world. It took place as the Thatcher government broke with the post-war consensus and embraced monetarism – deregulating finance, privatising key industries and undermining local democracy. Tony Burke (Unite Assistant General Secretary ) said: ‘During the dispute between the print unions and Rupert Murdoch’s News International in 1986 the media provided only fragments of the ‎real issues at stake and virtually nothing of the effects on the sacked workers, their families and our unions. Only a small number newspapers supported our members. Unite are proud to be associated with this film to tell the real story of the workers’ struggle with Murdoch, the police, the Tory Government and the right wing media. The documentary is being made with the News International Dispute Archive group whose publications, website and travelling exhibition have given a voice to the sacked workers and their families. We have filmed 20 interviews with sacked printworkers and the ‘refusenik’ journalists who joined them, and have made a rough cut of the film. But we need £ 20,500 (£4,000 for editing, £2,500 for on-line editing, and £14,000 for archive material transfers and copyright clearance). We would appreciate any support you can provide. All donors will receive a DVD and be credited in the final film. There is a strike of postal workers in Serbia. It started on Friday 22 March in the main sorting office in Belgrade and by now has spread across the country. – No victimisation of strikers. The dispute is about wages which are at the same level as six years ago, but in real terms lower by 30%. At around 300 Euros a month they are much below the Serbian average, which is among the lowest in Europe – around 450 Euros a month. Strike action puts the workers in a desperate position financially. Only 150 workers work on the night shift in the busy sorting office in Belgrade and workload is a massive issue. All postal workers will know that even with good conditions this can be a demanding job, but with so few workers the job becomes unbearable. It is obvious that the employer is trying to save money by employing fewer workers. Real fury arose when the Post Office director recently splashed almost a million Euros on luxury company cars for her cronies, showing that the Post Office doesn’t lack money. Anger at this served as the immediate spark for the strike. Postal workers have been suffering for years. Last year they were involved in numerous protests and a few limited strike actions. This strike promises to be the biggest struggle so far. Workers are organising supported by unions active in the Post Office (Samostalni Sindikat Poštanskih Radnika – Independent Union of Postal Workers). All workers have already been threatened with dismissals because of the strike action. They are however saying they will not back down until their demands are met. The demands are; a wage rise to national average, more workers employed at skilled and demanding jobs and withdrawal of threats of dismissals. It is of immense importance that the strike succeeds. It would be a first major victory for workers for a long time – stretching decades – and as such would mark a turning point in the workers’ and trade union struggle in Serbia. The Serbian Post Office is still under state ownership, but workers believe that management is preparing for privatisation in the future. Messages of support from trade unionists internationally can be a big boost to workers in Serbia.